Step 1 Season the beef with generous amounts of salt and pepper at least 1 hour, or up to a day, before preparing. Cover tightly and refrigerate overnight. Step 2 In a large, heavy-bottomed saute pan over medium-high heat, heat the oil. Add the bacon and cook until it is lightly brown but not crisp. Remove the bacon and save it for another use. Add the meat to the pan, browning well on all sides, in as many batches as necessary. As the meat is browned, transfer it with a slotted spoon to a heavy pot or braising dish. Step 3When all of the meat is browned, pour off most of the fat and lower the heat to medium. Stick the cloves in one of the onion quarters and add the onions to the heated saute pan along with the carrots. Tie a bouquet garni of thyme, savory, parsley, bay leaf and peppercorns in a small cheesecloth bundle (a tea ball works well too), and add it to the vegetables. Cook until the vegetables are lightly browned, then remove the pan from heat and add the vegetables to the beef in the stew pot. If using the oven, heat it to 325 degrees. Step 4To the saute pan in which the vegetables were cooked, add the brandy and red wine. Place the pan over high heat and cook until the wine is reduced by about two-thirds, scraping up all the brown bits from the bottom of the pan. Remove the pan from the heat and pour the reduced wine over the beef and vegetables. Step 5Gently stir in the tomatoes, coarsely-chopped garlic, orange zest, broth and 1 teaspoon salt. Check the level of the liquid; it should be at least three-quarters of the way up the cubes of beef. Add more broth if needed. Step 6Cover the pot tightly and cook at a bare simmer on the stovetop or in the oven for 2 to 3 hours, until the meat is almost tender. Check the stew occasionally to make sure that it is not boiling (lower the heat if necessary) and that there is enough liquid. When the meat is almost tender, add the olives for the final 30 minutes. Step 7When the meat is tender, turn off the heat and let the stew settle for a few minutes. Skim off the fat. Discard the bouquet garni. Taste for salt and add more if needed. Stir in the finely chopped garlic cloves. Serve with the chopped parsley sprinkled over. In Recipes-list.com we have selected the most viewed recipes from category - Main courses . Enjoy the best recipes specially selected for you! 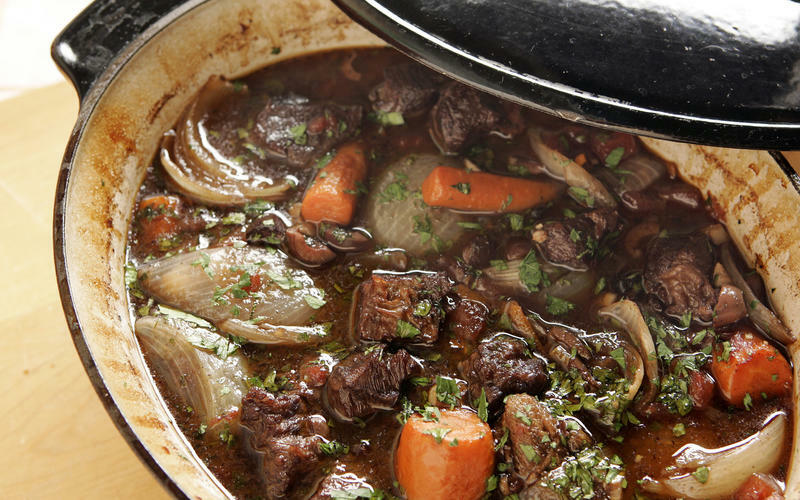 Beef stew with black olives is the right choice that will satisfy all your claims.